Sir Alex claims Mourinho and United unlucky not to be challenging Chelsea for the title. 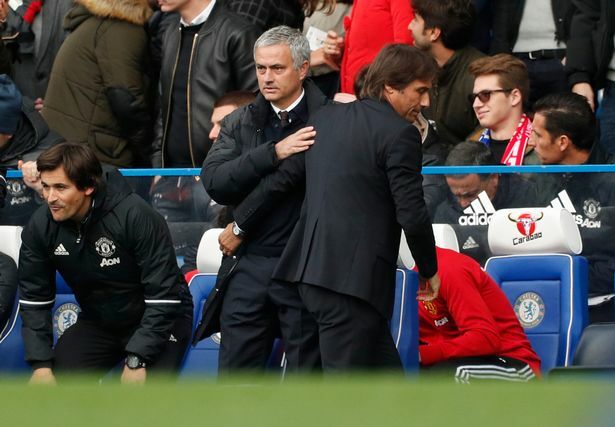 Sir Alex Ferguson has spoken of how unlucky Jose Mourinho has been in his first season at Manchester United and claims that they would be challenging Chelsea for the title. As with everything in life you can say "what-if?" but it doesn't hide the reality. The reality is that Manchester United are sitting FOURTEEN points behind Chelsea in the Premier League table with sixteen games to go and have a real fight on their hands to finish inside the top four. "I think he has done a great job. You can see he has got to grips with the club. The team is playing really well and he has been very unlucky. He has had six 1-1 draws and in every game he has battered the opposition. If they hadn't had all these draws, they would be there challenging Chelsea. That is the unfortunate part but he is going to have to live with that." - Source: BBC Sport. We all know that this game is about putting the ball in the back of the net and stopping the opposition from scoring in yours. United have the worst goal scoring record out of ALL of the top six having scored thirty-three goals with Manchester City being ten goals ahead of them in fifth. United find themselves in third placed of top six with goals conceded with 21 goals. United's overall goal difference is +12 compared to the likes of Chelsea +32, Tottenham +29, Arsenal +27 and Liverpool +24. We have to admit that in some of those games United have created plenty of chances but you MUST take those chances and for whatever reason, they have not. Chelsea, Tottenham and Arsenal have demonstrated over recent weeks exactly that. Sir Alex talks of the draws costing Jose Mourinho this season so far but look at their last two games. They rescued a point against Liverpool and if it wasn't for Wayne Rooney and his record-breaking free-kick on Saturday, they would have lost the game against Stoke. Think of all the money United has spent in the summer (and possibly this month) to only find themselves in sixth and as far behind as they are. If the situation does not change between now and the end of the season and they miss out on the Champions League, I wonder what Sir Alex would say of the job he has done then? The stats tell their own story. Just look at that table!